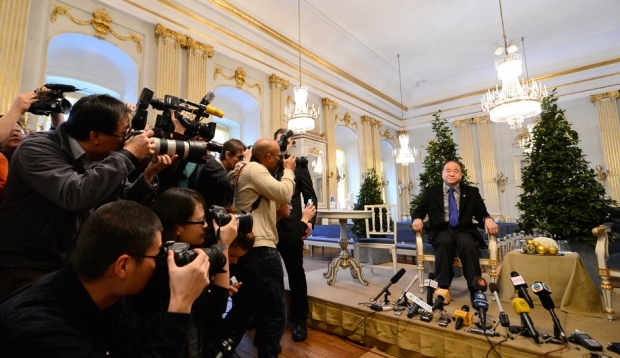 Chinese writer and 2012 Nobel Literature Prize laureate Mo Yan poses for photographers before giving a press conference on December 6, 2012 in Stockholm. In the most recent issue of the Kenyon Review, fiction writer Anna Sun prefaces her article, “The Diseased Language of Mo Yan,” with a long epigraph from Dr. Zhivago that amounts to a passionate indictment of the horrors of state socialism. Sun’s article tries to explain what is artistically wrong with Mo Yan’s fiction and thus why it does not deserve the Nobel Prize in Literature. Though Sun does not describe or interpret specific works by Mo Yan, she makes the following series of points: Mo Yan’s novels lack the “aesthetic conviction” of important English writers who have documented hard times; his language is “diseased” because of the damage Mao Zedong did to the Chinese language in the course of revolution and by being cut off from the grand Chinese literary tradition; the diseased quality of the language is manifested in its mixture of disparate language registers (old, new, crude, elegant, revolutionary), and his main translator, Howard Goldblatt, creates translations of Mo Yan’s work that are artistically superior to the originals. Sun does not point to any other deserving Chinese writers who might instead be considered for the Nobel Prize, so in the end not only is Mo Yan’s award questioned, but by her argument it seems doubtful that the prize could ever go to a Chinese writer. unlike the great novelists who grapple with the harsher side of the human condition—Dickens, Hardy, and Faulkner, for example—Mo Yan’s work lacks something important which these authors have, although it is seldom spoken of: aesthetic conviction. The aesthetic power of these authors is the torch that illuminates for us the dark and painful truth of humanity. The effect of Mo Yan’s work is not illumination through skilled and controlled exploitation, but disorientation and frustration due to his lack of coherent aesthetic consideration. There is no light shining on the chaotic reality of Mo Yan’s hallucinatory world. Sun makes it abundantly clear that she does not like the language of Mo Yan’s fiction, which she calls “diseased.” In one sentence, she says it is a jumble of disparate linguistic registers; two sentences later, however, she describes it as “repetitive” and “predictable,” but emphasizes that in any case to her it is “mostly devoid of aesthetic value.” This is a strange argument to make about a twenty-first-century writer. English writers of a century or more before could no doubt afford to shed light on their worlds from a single moral and cultural perspective. However, the subsequent history of the world and its literature have departed from the kind of moral certainty of Dickens, precisely because of the crumbling of the moral foundations of the world of imperialism and the industrial revolution. One thinks of the emergence of avant-garde techniques like stream of consciousness or psychological realism in the wake of World War I (employed by authors such as Thomas Mann, Virginia Woolf, and James Joyce) as a means of coping with historical trauma, of the landmark absurdism of a Franz Kafka, George Orwell, or Jorge Luis Borges to deal with the specters of socialism, bureaucracy, and alienation. Piling up aesthetic objections to conceal ideological conflict is a familiar tactic. I had the opportunity in 2000 to discuss the Nobel Prize in Literature with members of the Chinese Writer’s Association (of which Mo Yan is now Vice Chairman) after it was awarded to the Chinese author Gao Xingjian, who was by then a French citizen. It was then I learned that the Chinese Writer’s Association’s “line” on the Gao Xingjian award was not that his works contain politically unacceptable ideas (in fact, his novels published after leaving China are very critical of the Chinese government); rather it was that Gao Xingjian is a mediocre writer, and there are many superior to him in China more deserving of the award. The writers I was talking to did not exactly say that Gao’s work lacked “aesthetic conviction,” but their criticism of Gao looked very similar to Anna Sun’s criticism of Mo Yan, even though they are supposed to be defenders of state socialism. Sun goes on to explain that Mo Yan’s language is diseased because of its disconnection from the grand Chinese literary tradition. But she reconstructs that tradition purely from its exquisitely lyrical side (the Book of Songs, poets like Li Bai [Li Po] and Su Shi, Tang Xianzu’s romantic Ming play Peony Pavilion and Cao Xueqin’s Qing dynasty masterpiece of love and manners Dream of the Red Chamber), while neglecting the extravagantly epic legacy of Sima Qian’s Records of the Grand Historian, and adventurous, bold, and humorous novels like The Outlaws of the Marsh and Journey to the West. To be sure, there are as many literary canons as there are readers, but the balance between the lyrical and the epic in the history of Chinese literature is widely recognized. Sun is deliberately leaving out widely accepted masterpieces of Chinese literature that were surely among the imaginative and stylistic resources for Mo Yan’s work. Mo Yan may have grown up during the Cultural Revolution, but when he emerged as a writer in the 1980s, both the lyrical and epic sides of the Chinese literary tradition would have been available to him, as well as translations of Faulkner and Gabriel García Márquez, not to mention Dickens and Hardy. But the real problem with Sun’s proposition of “diseased language” is that it deprives modern Chinese writers of their creative agency. To Sun, Mo Yan’s “diseased language” disqualifies him from the comparison to Pynchon, Rushdie, and DeLillo that the Nobel committee’s term “hallucinatory realism” invites, and he is measured instead against writers of much earlier eras (Dickens, Hardy, and Faulkner), and still found wanting. Her argument is that Maoism irreparably damaged the Chinese language, infusing it with artificial terms and concepts and crude perspectives. Moreover, in Sun’s account, this apparently happened in one fell swoop, some time in the 1940s. In fact, there has been a rich and fascinating modern Chinese literature built on linguistic and cultural iconoclasm since the aftermath of World War I, well before Chairman Mao tried to press it into the service of his revolution. By Sun’s standards, one would have to consider a cultural icon like Lu Xun and accomplished novelists like Mao Dun and Wu Zuxiang afflicted with diseased language as well. Moreover, while it’s true that the Chinese Communist Party under Mao Zedong’s influence used language and culture, among other forms of coercion, to violently assert control over the masses and their writers, and that in some ways, the resulting damage to Chinese culture was irreparable, Sun’s attribution of Mo Yan’s diseased language to Chinese Communism and to Chairman Mao is highly ironic: the very concept of “MaoSpeak” (Mao wen ti) was coined by cultural figures in Mo Yan’s cohort in the 1980s to designate the new literature’s target of attack. If anything, Mo Yan’s fiction is a resounding of satire of the absurd banality of MaoSpeak from a much broader historical and cultural perspective than that of socialist culture before Reform and Opening, and this is why one would expect his fiction to manifest a variety of linguistic registers. Perry Link, writing in the New York Review of Books, provides us with a glimpse of several of Mo Yan’s novels in his overview of the author in an essay entitled “Does This Writer Deserve the Prize?” Link is a leading scholar of modern Chinese culture, so he does not seem to blame Mo Yan for betraying the Chinese literary tradition, but he does appear to agree with Anna Sun that the Mo Yan’s language is diseased. Link writes: “The deeper question, though, is how and to what extent a writer’s immersion in, and adjustment to, an authoritarian political regime affects what he or she writes. The issue is both subtle and important, and Mo Yan provides a useful example of it.” It is a deep, psychological affliction that for some requires a clean break with the Chinese language altogether: “Ha Jin took the unusual step of departing not only China but the Chinese language; he writes only in English, in part to be sure that even subconscious influences do not affect his expression.” I am not yet convinced that this is the main reason Ha Jin writes in English, but it would be a sad state of affairs if writers were so vulnerable to the ideological baggage of their native language that they are unable to create a healthy literary language with it. My point is not that Mo Yan is these writers’ equal, but rather that like them, he forcefully asserts his particular vision without regard to pressures to adopt and convey a political posture. Literature like this is not apolitical—no literature can be—but it is not written to serve a political agenda. Mo Yan’s fiction satirizes the inhumanity of self-serving and hypocritical government officials while also depicting the senseless suffering of their victims; it also satirizes the style and narrative conventions of the orthodox socialist literature of the past, with its celebration of unbelievable heroes and cartoonish oversimplification of society and history. He indicts the One-Child Policy and forced abortion. The orthodox literature of socialism made politics sacred, but Mo Yan’s fiction shows orthodox politics to be profane in the face of humanity. All literature is political, but each writer figures politics in a different way. Social revolutions and their attendant cultures are a large part of the modern human experience—a painful one, and one that may in retrospect have failed to bring liberation and fulfillment to their populations, but one that is nevertheless part of our collective human experience. The idea that art is essentially the expression of the indomitable human spirit struggling to break free of the chains of oppression is very appealing, and it has circulated throughout the commentary on Mo Yan. From this perspective, Mo Yan’s status as a citizen of a socialist nation that is ideologically repressive, and moreover a Party member and a government official, disqualify him from the possibility of creating such art. But the remarkable thing about the People’s Republic of China is that after the death of Chairman Mao, in the subsequent period of Reform and Opening under the leadership of Deng Xiaoping and his successors, there has been a cultural renaissance in the areas of literature, fine art, film, music, and beyond. The achievements in these areas have been internationally recognized for a quarter of a century and continue to impress the world, without being required to be bolder in their opposition to rule by the Communist Party. Because of language barriers, international awareness of the progress of Chinese literature since the 1980s in China has not kept pace with other artistic endeavors, even with the herculean efforts of translators like Howard Goldblatt (translator of Mo Yan’s work into English) and a few others. Even so, contemporary writers are attracting a growing number of talented young translators. Mo Yan is one of the pioneering voices in these new generations of Chinese writers; he and other novelists of his generation like Wang Anyi, Yu Hua, Su Tong, Yan Lianke, and Zhang Wei, or the poets Zhai Yongming, Xi Chuan, Yu Jian, Ouyang Jianghe, and many, many others after them, have since the 1970s devoted their lives to literary creation as much as writers all over the world. They have increasingly engaged with the writers and literatures of other countries and created a diverse corpus that reflects a unique cultural and historical experience. Am I to understand from Mo Yan’s critics that unless Chinese writers and artists are more “politically courageous” and invite imprisonment and exile—or worse—by speaking out directly against their government and political system, their lifetime of artistic labors and achievements will never be worthy of international recognition in the form of a Nobel Prize in Literature? Perry Link ultimately does not answer the question “does this writer deserve the prize?” But he does make an important point in his concluding paragraph: “It would be wrong for spectators like you and me, who enjoy the comfort of distance, to demand that Mo Yan risk all and be another Liu Xiaobo. But it would be even more wrong to mistake the clear difference between the two.” Indeed, Liu Xiaobo is a literary scholar and a public intellectual who won the Nobel Peace Prize in 2010. Liu is an admirable and important figure in modern world history, but he is not a literary author. The Nobel Peace Prize is not awarded for literary achievements, nor is it awarded by the same committee that awards the Nobel Prize in Literature. Thus when discussing the merits of Mo Yan’s receiving the Nobel Prize in Literature, I think it is misleading for us to compare its validity to that of awarding the Peace Prize to Liu. In fact, it’s precisely this confusion that lies at the heart of the debates about Mo Yan: he is being evaluated by the criteria of the Peace Prize (which raises a whole different set of contentious issues), as a public intellectual, and for his contribution to the advancement of humanity, when we should really be talking about his literary accomplishments. All literature has political meanings. No literary accomplishments are purely aesthetic. It is not conceivable to me that a morally indefensible novel could be outstanding artistically. Mo Yan writes about political tensions in Chinese society and the tragic mistakes of the Chinese Communist Party with humanism and conscience, even if he does not write about them in a manner that gets him exiled or imprisoned. I disagree with Perry Link and many other of Mo Yan’s critics’ sense of how literature is political. They want all or nothing; to them, a Chinese writer redeems himself only by incurring the wrath and punishment of the government, otherwise his writing is too soft on socialism. Mo Yan’s choices, when given the opportunity to publicly push back against tyranny, have been disappointing. Many critics point out that he participated in the creation of a handwritten anniversary edition of Mao’s 1942 “Talks at the Yan’an Forum on Literature and Art,” which are largely blamed for the culture of repression in Chinese literature and art ever since. This criticism implies that Mo Yan, Vice President of the official Chinese Writers’ Association, should have conspicuously refused to participate in what in effect is an unremarkable act of political ritual. Writing some passages of the “Talks,” part of the People’s Republic’s cultural iconography, is akin to singing “The East is Red” or visiting Mao’s mausoleum—a mild gesture of patriotism even less surprising when performed by a government official. Does such an act really imply an affirmation of Mao’s worst atrocities?